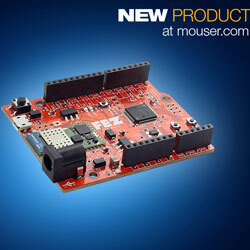 Mouser is the first distributor to stock GHI Electronics’ FEZ T18 maker boards, the latest boards in the FEZ series. These advanced and user-friendly boards are pinout-compatible with Arduino Uno boards and shields. They can be programmed utilising multiple programming languages and development environments. The maker board include a 32-bit STMicroelectronics STM32F4 Arm Cortex-M4 microcontroller with 512kBytes of flash and 96kBytes of SRAM. The STM32F4 chip is supported by a mixture of common platforms — including Arduino, Arm mbed, MicroPython, Keil, GCC, and FreeRTOS — as well as the company’s TinyCLR OS, allowing engineers to select their development environments. The TinyCLR OS allows managed .NET development and debugging using Visual Studio with support for programming in .NET, C# and Visual Basic — all through a USB cable with no additional hardware needed. The OS also combines the necessary drivers to make secure Wi-Fi connections available through a .NET-compatible interface. The boards are offered with an optional onboard Wi-Fi module that comprises a complete and secure networking feature set for the IoT.